Breville Juicer Makes an Ok Juice. My family and I have jumped on the health conscious bandwagon. 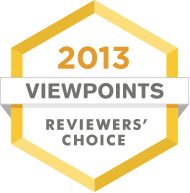 We purchased the Breville too soon after reading several reviews online and saw that it was the best choice for us...at the time. However, after a few uses with the Breville juicer I have had a slight change of heart. The Breville juicer makes delicious juices but that's not because of the actual appliance. I can thank the delicious fruits and veggies for that. The pulp does not get disintegrated all the way. Which leaves me with having to use a lot of fruits and veggies for a small amount of juice. On top of that, the noise is so loud. I mean, I expected itto make a little noise but I literally have to scream over across the kitchen when we are juicing. I gives this appliance an 8, because you get what you pay for and it isn't a terrible juicer, by no means. I just would recommend a little investment for better quality. 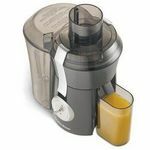 This Breville juicer worked very well for our 10 day juice fast, and we have used it since for various juices. It handles a wide variety of fresh produce like a champ, including kale, spinach, apples, garlic... Anything we threw at it. The juice comes out pulp free, but can often accumulate a foam on top, depending on what you're juicing. I personally like the foam, but my husband wasn't a big fan. You could either strain the juice or just swipe the foam off the top of the juice if you don't like it. The only other negative I can think of with this juicer is that it is difficult to clean if you don't do it right after juicing. The blade or sharp screen is very easy to cut yourself on while cleaning. The scrub brush included for cleaning works well though! We have used this juicer probably 50 or more times now, and we are still very happy with it. We looked through several reviews bwfore making this purchase and now have no regrets! I bought one of these juicers based on a recommendation from a juicing diet book. 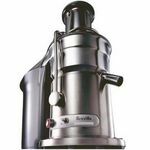 The author recommended the Breville Compact Juicer as a good starting place for beginning juicers. His comment was that the juicer provided plenty of power and quality, without breaking the bank. I have been reasonably happy with my Breville Compact. I have been using this juicer for a little over a year. I use it at least once a day, sometimes as much as four times a day. I have no had any issues with the juicer that required contacting the manufacturer for warranty work. I would have given this a ten star review, except I have a couple things I wish that Breville would improve about this juicer. First, I wish that the pitcher was a littler larger and fit a little snugger against the spout. The pitcher can sometimes be off center a bit and cause spilling of stinky and expensive juice. Also I wish I could fit more juice in the pitcher for those times when I would like to make more than one serving at a time. Second, I wish that there was less pulp left behind when I make the juice. I wish I wasn't wasting all that food/fiber. Super juicer, really tears through fruit and vegetables, juicy! 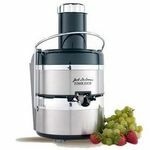 Tremendous juicer, we've had a few now and this one really churns out the freshest quality juice and vegetable mixes i've ever seen. Very tasty and very healthy mixes. Pulp Setting Effectiveness Pulverizes like magic, really sifts through the dense parts of foods and sands them down to pure liquid. Sometimes we lessen the speed settings if we're looking for more pulp but it really burns in clean if you want it to. Stability While in Use Slight noise volumes but the vibrations are quite minimal and hardly noticeable. Hasn't effective the motor or quality at all, still melts them down quick. Ease of Cleaning The pieces come apart quite well and have always cleaned up fairly quickly without much mess. Fits in the dishwasher quite well if needed as well. Durability Always runs smoothly. No major dings or anything rough happen with the outside, assembled very well and the motor keeps chugging along. Versatility/Number of Features Many different settings, we got it for our anniversary in May and we've gone through a couple dozen batches of smoothies with all kinds of different textures and thicknesses. Great stuff! Design Really modern design, quite elegant and complimentary to our other appliances. Breville Juice Fountain Compact Juicer is one great juicer. I entered a contest and was the first place winner. Yay me! I already had a juicer, Jack La Lane, which is great. This juicer is so much more sophisticated and has features that the Jack La Lane does not have. I like that it has a measured cup that fits nicely so your juice comes out without any splatter. Pulp Setting Effectiveness When you juice there will be pulp. With the speed and power of this juicer it extracts all the juice from your fruits and vegetables. Pulp is to a minimum. Nothing goes to waste though since the pulp can be added to breads, cookies, salsa or smoothies. Be creative in the kitchen and find more uses for pulp! Stability While in Use The juicer handles well and stays secure during use. This juicer is well constructed and is solid during the extracting process. Ease of Cleaning All juicers are a bit intense to clean. This one is no different. Parts can be put in the dishwasher for easy clean. The juicer came with a cleaning brush. Durability I use my juicer quite often so it does get a workout. It has been going strong for a year now and still looks brand new. Versatility/Number of Features Has a locking feature, measuring cup, brush, manual with recipes and so easy to use. Design The juicer has an appealing look to it and compliments any style or décor you may have in your kitchen. This juicer is the second one I have owned from Breville. They make amazing products and this juicer is another great product in their line. I was looking for another juicer that was more small and compact and easier to store. I like to juice at least twice a week and my other juicer was a pain to clean and more time consuming. This juicer was just what I was looking for. It is a smaller design, but has the same power as the larger juicers. I can juice all types of fruits and vegetables and this juicer doesn't bat an eye. It is powerful and durable and worth the money. Stability While in Use This product doesn't shake at all, I can put whole apples into the machine and it doesn't even struggle to juice. Ease of Cleaning This juicer is much easier to clean than any other juicer that I have owned. I love that I can juice and clean up everything in less than twenty minutes. Design The design is the reason I bought this, it is much smaller and easy to store. It is not as heavy as other larger juicers. I started looking for a juicer awhile back and I was a little overwhelmed by all the choices there are out there. I started seeing great reviews for the different Breville juicers so I eventually narrowed my choices down to on of their juicers. I live in a small house with a small kitchen so I did not want some big clunky juicer. I loved the way the Breville Juice Fountain Compact Juicer looked, sleek and small, only taking up a little counter space. The first time I tried it I knew I had made the right choice, it's absolutely fantastic! I use my Breville Juice Fountain every day. I make so many different kinds of juices with it. It easily juices up any fruit or vegetable I put in it, and the juice is of course great for you. If you want a juicer for your home, I definitely recommend this one. Pulp Setting Effectiveness Makes a lot of juice and the pulp collector is great. Stability While in Use Very stable Ease of Cleaning This juicer is so incredibly easy to clean, it literally only takes a few minutes, you take off a few parts, wash them, and easily put it back together. Design I love the sleek clean design of this juicer. 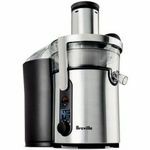 Breville BJE200XL Juicer is small, easy to use and powerful. 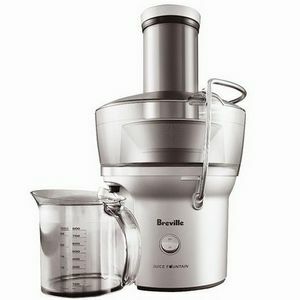 Breville BJE200XL Juicer is small, easy to use and powerful. When I started looking at juicers, I notice that many are VERY large. Well, I did not want to a giant machine that takes up a big space on my counter top. So one big feature of this machine is that it has a pretty small foot print. I don't make juice every day, so I didn't think that a juice machine deserved a lot of my kitchen counter real estate! What I was looking for (and found in the Breville BJE200XL) was a powerful juicer that was easy to use and easy to clean. That's exactly what the Breville BJE200XL delivers. It has a very wide feeding opening (about 3" diameter). So I don't have to spend a lot of time dicing and chopping the fruits or vegetables I put into it. I saw many other models that would require much more preparation time on what I am going to juice. Cleanup is a snap! Everything that needs cleaning goes right into the diswasher. I do give the items a quick rinse, then my dishwasher does the rest. The quality of the juice is very good. But I wouldn't use it as often as I do if it took a lot of work to use and clean. It is a little noisy, but I expected that. Overall, I really like it. And I use it more than I expected. My rating is a 10! This juicer is amazing. I received it as a Christmas gift and have been using it everyday. The product is very easy to use from beginning to end. Juice taste great, easy to clean. Looks great on the kitchen counter, very functional. I highly recommend this product for families. I use it to juice veggies while my children use it for fruit blends. It is a great value rather than buying juice from the stores and paying an arm and a leg. The machine does not make loud noises while juicing. I've been using this machine for almost 3 months and am amazed at the value of this product. It can handle whole fruits and veggies, they do not need to be diced. Very little pulp comes out of the machine. It is stable while juicing, very durable and above all, easy to clean. The design is also wonderful. It has only one speed, which is fine. Just a simple, no nonsense machine to have. Cannot ask for anything more.